Did you know that with one simple trick you can stuff your own sausage? In just five minutes I stuffed Italian sausage with mozzarella cheese and popped it into the oven to bake for dinner. 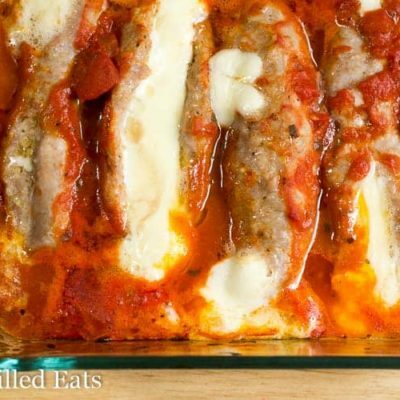 This Stuffed Sausage Recipe is perfect for any night of the week. I am the queen of fast dinners. And by that, I don’t mean I make the most delicious fast dinners all the time (although some are pretty darn good) what I mean is that most nights of the weeks 5 pm rolls around and I haven’t even thought about dinner yet. But somehow I get it on the table by 6 anyway! 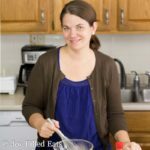 During the school year, the afternoons are packed full of homework, emptying lunch boxes, washing school uniforms (because someone always falls into the mud or spills their lunch) and other mom tasks. And then in the summertime just seems to fly by. Easy dinners are always a necessity no matter the month. 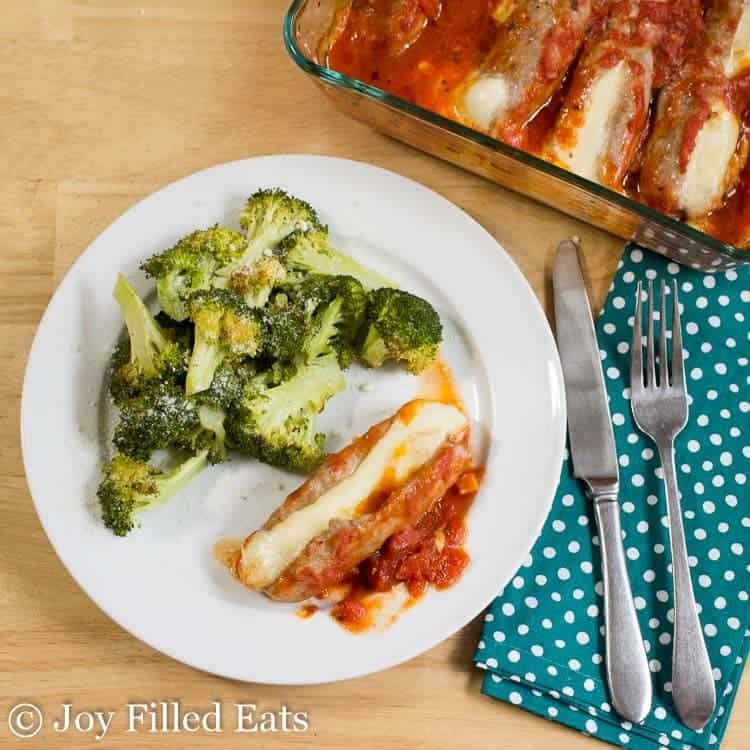 I have a few tips for last minute dinners that are still real food (because we all know frozen pizza is quick and easy – and we are not above that in my house either). 1. Always have fresh or thawed meat in the fridge. And/or meat that cooks quickly from frozen like individually frozen chicken tenders. 2. Always have steam bags of frozen veggies and/or washed and ready fresh vegetables and salad greens. 3. Keep a stocked pantry with a variety of spice blends. 4. Have a nice assortment of condiments in the fridge. With those items, you can put dinner together in a flash. So, my trick to stuffing sausage is simple. Use kitchen shears to split open the casing along one side. Do not remove the casing. Simple open the sausage down the middle, stuff in the cheese stick, and then reform the sausage around the cheese stick. 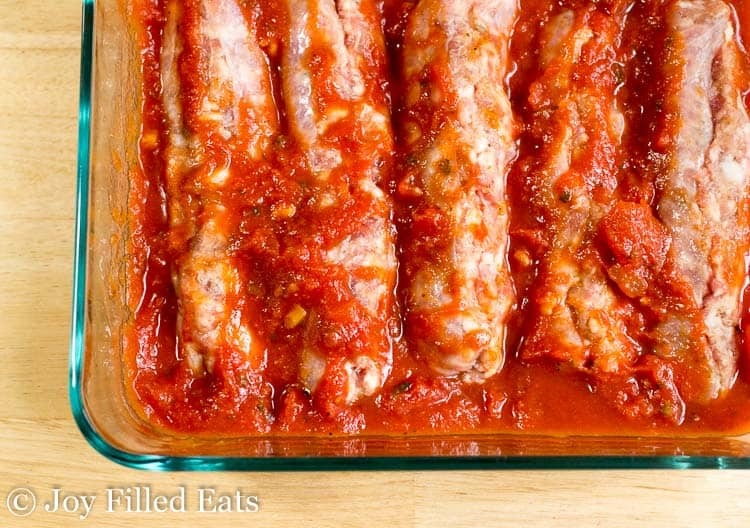 You can use this same method and add any ingredient you like to your sausage. I want to try adding some lightly sauteed peppers and onions to the sausage. I know you can buy sausage at the grocery store with peppers and onions added in but I’m positive they will taste so much better with fresh. Before, above. After, below. The cheese gooed out a little bit but for the most part, it stayed inside each stuffed sausage link. Chicken tenders with a creamy parmesan sauce with broccoli. Turkey burgers on top of salad. Tacos with all the fixings. (This is even easier if you make a big batch of taco meat and freeze some). 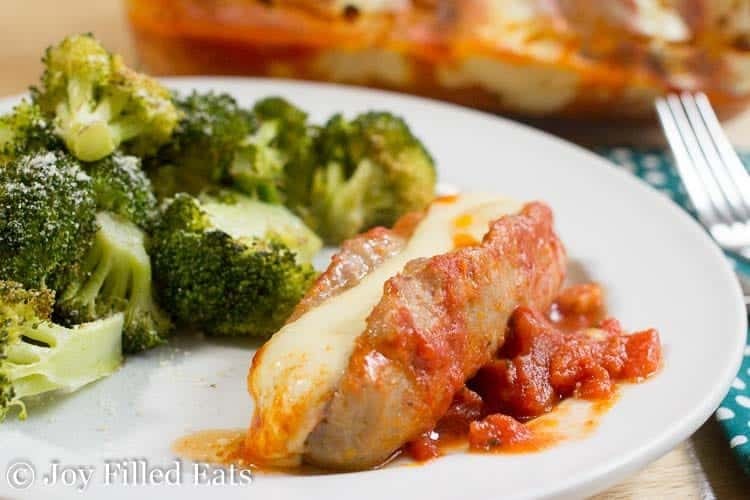 For a whole list of dinners with less than 5 ingredients check out my post on Easy Keto Meals with 5 Ingredients or Less! This has over 25 Low Carb Entrees. Use kitchen scissors to cut a sausage down the side. Do not remove the casing. 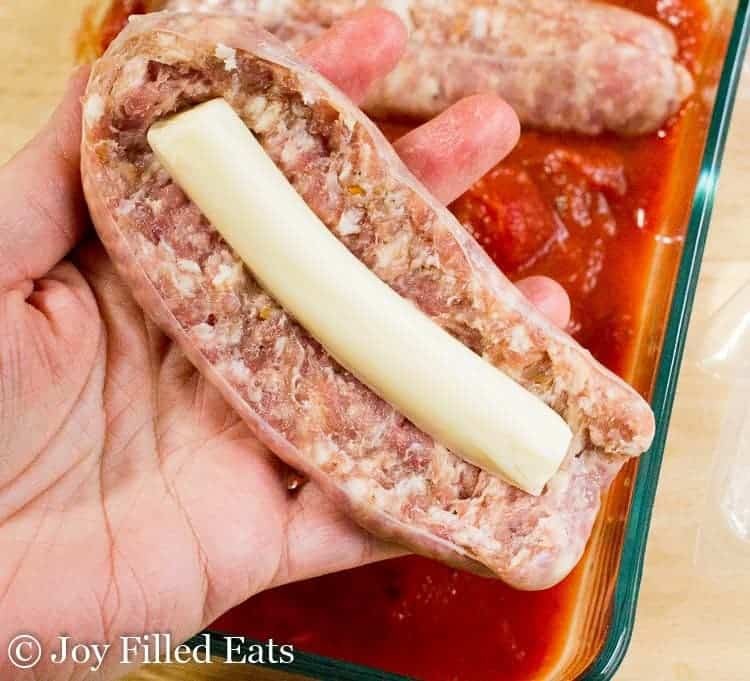 Put a mozzarella stick inside the sausage and press it back into its shape. Put it casing side down in an 8 x 10-inch baking pan. Repeat with the remaining sausage. Pour the marinara sauce over the sausage. Bake for 30-40 minutes until the sausage is 160 when checked with a meat thermometer. Any type of sausage with a casing will work. Turkey, Pork, Chicken, whichever you prefer is fine. It just needs the casing to hold it together. Am going to try and add fresh spinach to the Italian sausage while baking. Any ideas? I'd just put the sausage on top of the spinach. Once the spinach wilts drain the liquid and add the sauce. 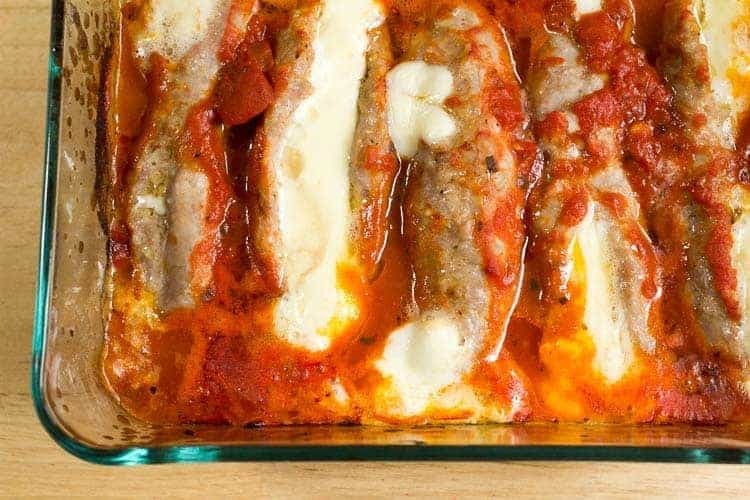 How long should I bake if I'm using precooked sausage? 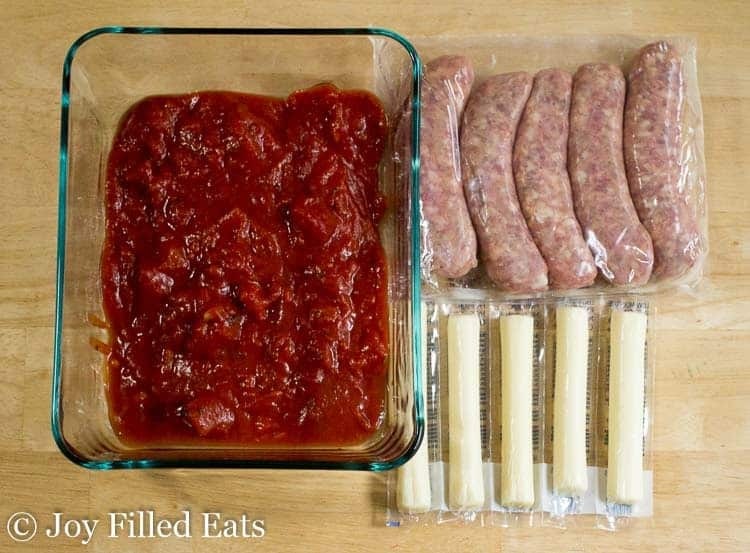 I'm not sure you'll be able to put the cheese sticks into pre-cooked sausage. If you can't you can put cheese on top. You only need to bake until it is hot. Maybe 20-25 minutes at 350. On my way to the kitchen to make this right now. Excellent idea. I can't wait to try this! I'll add peppers and onions to cook in the sauce. Exactly my thoughts, peppers and onions and in the oven it goes! Can't wait til it's done! Of course. This would be great with pesto or alfredo sauce. This is one I've gotta try! I love how easy this is! I have a feeling it will be a staple in our rotation!